A key Senate committee approves legislation that calls for the U.S. to provide small arms to moderate rebels fighting Assad. A key Senate committee on Tuesdayoverwhelmingly approved legislation that calls for the U.S. to provide small arms to moderate Syrian opposition groups fighting strongman Bashar al-Assad, the Wall Street Journal reports. The 15-3 vote by the Senate Foreign Relations Committee showed broad support from both Democrats and Republicans for arming the rebels, though some lawmakers from each party voiced concern over the difficulty of ensuring the weapons aren't misused and won't slip into the hands of radical Islamists aligned with Al-Qaeda. The vote comes as the government of Syrian President Bashar Al-Assad, fighting alongside terrorists from Iran-backed Hizbullah, engaged in a third day of an offensive on the Syrian city of Qusayr. Intense fighting in the city on Sunday killed 20 Hizbullah terrorists, among them a senior member of the group. The bill to arm rebels still faces a lengthy legislative road to enactment and doesn't require the administration to provide the arms, noted the Wall Street Journal. The legislation now goes to the full Senate, where approval could spur action in the House of Representatives on a similar bill that was introduced earlier this year but has yet to advance to a vote. 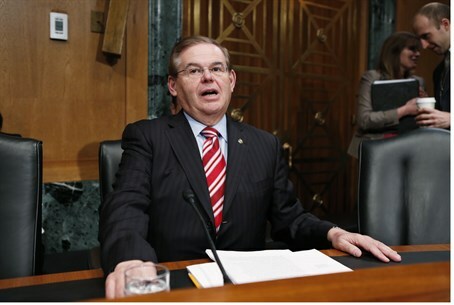 "Vital national interests are at stake and we cannot watch from the sidelines," said the committee's chairman, Sen. Robert Menendez, a New Jersey Democrat who introduced the Senate bill several weeks ago. President Barack Obama rebuffed a proposal last year to arm moderate rebel groups despite support for the move by top cabinet members, including then-CIA Director David Petraeus and then-Secretary of State Hillary Clinton. In recent weeks, however, Obama and his advisers have begun looking once again at the option of providing arms to moderate rebels groups, possibly in concert with key allies Britain and France, according to senior administration officials. The Senate bill introduced by Sen. Menendez authorizes the U.S. to provide small arms and training to units of the Free Syrian Army and other groups opposed to the Assad regime "that have been properly and fully vetted and share common values and interests with the United States." The bill says antiaircraft systems may not be transferred, however, according to the Wall Street Journal. Sen. John McCain, an Arizona Republican who has been an outspoken critic of Obama's response to the Syria crisis, said the legislation "sends a signal to the administration" that it needs to get more involved in helping end the crisis in Syria. During Tuesday's hearing, several lawmakers raised objections to providing small arms. Sen. Mark Udall (D-Colo.) warned of the dangers of arming rebel forces whose intentions are unknown. "I think we have to ask the question, Who are we arming?" Sen. Udall asked fellow senators. "To tell you the truth, I don't think we know who we're arming. The truth is it changes every day," he added, according to the Wall Street Journal. Sen. Rand Paul, a Kentucky Republican, said lawmakers who supported the legislation were in effect supporting the provision of arms to rebel groups that are "the allies of Al-Qaeda," referring to the Islamist Al-Nusra Front, a powerful rebel force in the insurgency against Assad, which recently publicly pledged allegiance to Al-Qaeda. "It's an irony you cannot overcome," Paul was quoted as having said.